Over the course of a very long day at the Tour of California, my Sambas somehow rubbed most of the skin off heels. That didn't stop me from walking a mile and a bit to R15 to meet up with various bikey blogey folk. I'm glad I went! I talked to lots of great people and met a few who I know from their podcasts and blogs. 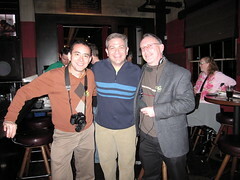 Among them, Fritz of Cyclelicious, David of the Fredcast, and Jon from Bikescape. What a treat! I also met Jonathan of Bicycle.net (before he had to dash off and post coverage of the day's action), Markus of Cyclefilm (who has done a video of the route of L'Eroica I must watch immediately), local Sacto blogger Saccyclechic, and Paul, co-author of The Bike to Work Guide (thanks for the copy you gave me, Paul!) and blogger on bike commuting. In my first ever video posting to Flickr, here's a brief glimpse of Tyler Hamilton in the Prologue. I went for a nice walk around the site of the Tour of California Prologue stage in Sacramento this morning. It was still pretty early (I'm still on East Coast time! ), but I was in time to see lots of the big vendors arrive. 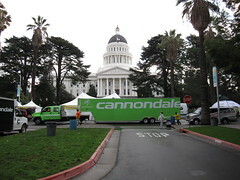 So, here I am in Sacramento for the Amgen Tour of California. Exciting? You bet! Justin and I arrived this afternoon, and we'll be exhibiting at the so-called Lifestyle Festival tomorrow. The weather is looking pretty grim, though. It's cold now and wet and cloudy. It's neat to see the other bikey companies around - there's a big Orbea van at the Clarion hotel next door, and Schwalbe is here at the Holiday Inn Express with us. I had a nice chat with the proprietress of a really good newsagent on 20th Street - she said everyone in town is psyched for the race. Okay, here's what I'm thinking for Kim. 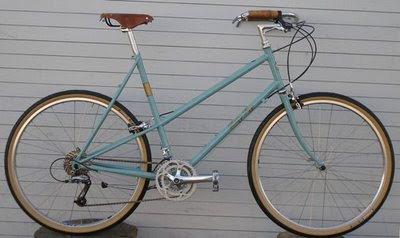 She wants/needs (I want/need for her...) a bike that's sweet and stylish, easy to ride, and geared for pedaling up our big hill at the end of a long day. She loves her 35lb German city bike, but it doesn't have the gearing she needs. There's no shortage of performance women's bikes out there, but she prefers an upright riding position. So I think we're going to go with the new Rivendell Betty Foy. It's as pretty as could be (as befits the rider in this case), and should last her for decades. It should be available soon, and we're lucky that we're near a dealer that should be able to sort us out too! Ah, what a great feeling! My ride today was pure bliss. I didn't break new ground by any means - I just did my usual loop up to Carlisle, then Concord and home via Mill Road, about 30 miles. But still, I managed to keep great energy up the whole time, and a pretty good pace, particularly considering how little exercise I've had over the past several weeks. Now I'm home and completely invigorated! Ready for a fun Sunday with the girls. Since I left just before 7, I didn't see too many other riders. Lots of runners in the hinterlands of Carlisle and Lexington, though. Much of the road surfaces are still a bit treacherous. The main roads are bordered with streams of melting slush and berms of ice, and the edges are very gravelly. Lesser roads have SERIOUS potholes in spots, and many also (like Mill Road in Lexington) have patches of thick ice and dirty packed snow. Not a big deal if you're expecting it, but it could be nasty if you're not. Before tackling the Park Ave hill towards home, I saw at least a dozen cyclists congregating outside Quad Cycles on Mass Ave in advance of the 10:00 regular Sunday ride. I'll make it out on one of their rides eventually, but I really do like my early-morning solitude. Very calming and restorative, plus, I have all my best ideas about work at these times - and today was no exception. Finally a decent day for a ride! It's 43 degrees and really mushy outside - perfect for a short ride! I'm dosing up on coffee & oatymeal now, which should hold me until my snack stop in Concord. In the meantime, I was just browsing through this & that, and via the Best Buddies website, I've come across MapMyRide.com. Interesting! It's a nice Google-map-powered app that lets you document rides & routes, and even track your bikey workouts. It also has a downloadable iPhone app, which is REALLY fun..... if you have an iPhone, anyway. Better get one quick! The site immediately identified me location and presented rides recorded by others in the area. Neat!